The suit, which kicked up a political storm, was later sold at an auction for Rs 4.31 crore. SIDDHARTNAGAR: Chief Minister Akhilesh Yadav today claimed that Narendra Modi was copying clothes worn by others, a day after the Prime Minister alleged that exam centres were being auctioned in UP for copying. "Prime Minister you are telling me about copying in examinations, in education...Who is copying by wearing clothes worth lakhs of rupees," he said addressing election rallies in Uttar Pradesh's Siddhartnagar and Santkabirnagar. "There was a very big man who had worn a suit which had his name on it...I want to ask the BJP people who was the first person who wore suit with his name... I will say you people have also copied," Akhilesh said. "The example of PM's copying came to light when American President came to India, he wore a suit with his name imprinted on it...whom had he copied then," he said. Modi had worn a pinstripe monogrammed suit during the visit of the US President Barack Obama in 2015. The suit, which kicked up a political storm, was later sold at an auction for Rs 4.31 crore. Alleging that the SP manifesto was copied by the BJP, Akhilesh said, "Who has not copied a little bit in examinations for passing...raise your hands and tell me who has not copied in their childhood for passing.... PM you are also copying different things." "It seems as if everyone here is passing by copying... even the toppers," he said. Addressing an election rally in Gonda yesterday, Modi had alleged that tenders were floated to encourage adoption of wrong practices in examinations, like mass copying. "In Gonda, even theft is carried out as a trade...tenders are floated for allotting examination centres...this is not good for anyone and this should be stopped...this auction of examination centres should be stopped," he said, adding he was afraid to speak on this issue as it could give idea to others to follow this trade of SP which needs to be stopped. "Crime attached with education will spoil the coming generations," Modi had said. On Modi's retort on his donkey remark, Akhilesh said, "In Bahraich, the Prime Minister gave a ten minutes speech on donkey and BJP leaders told me that UP CM does not know the speciality of donkey...tell me does any one of you want to know about it." 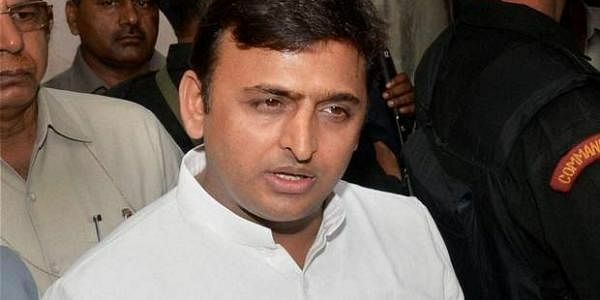 "If not, you people need to help me...do not know where they have reached...they are going towards graveyard and cremation ground and talking about holi and diwali...SP people are the ones who work towards promoting brotherhood and uniting people," Akhilesh said.